Their faces are on TV screens everywhere. The major motion picture houses film them. The paparazzi stalk them for photographs, but when the stars want a portrait of themselves, who do they go to? TARANTOLA. When Diana Ross wanted to create her image on the album cover of her Grammy nominated, "It's My Turn," she chose TARANTOLA because he captures the spirit, passion, and the very life of his subjects. His paintings come alive. To capture the essence of Rita Hayworth, daughter Princess Yasmin Aga Kahn chose a TARANTOLA portrait, which adorns the lobby of the Alzheimers Foundation. 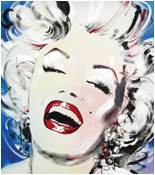 When Salem House published Marilyn In Art, a TARANTOLA was a must. When creating Elvis In Art, St. Martins Press also knew the collection required a TARANTOLA as well as Madonna in Art. Deemed a "celebrity pop artist," his collection of over 2,000 portraits documents the entire spectrum of famous personalities in sports, entertainment, and politics. Both black & white and color creations in oil and mixed media idealize his subjects with a striking warmth and brilliance which channels their essence, inviting the viewer to participate in the creative experience. A descendent of Giustiniani Finocchio, a stone sculptor for the Pope in the 1800's, TARANTOLA'S creative roots date back generations. Without formal training, he has developed a style unique and unspoiled by discipline. "I paint to channel out from within. All things affect me. Inspiration is my motivation and art is my interpretation." TARANTOLA'S drawing career began at age five. A car accident rendered him comatose, and when he awoke, his first request was a pencil and paper to draw the characters on the nursery wall. His parents, in support, offered the walls in their home as his first canvases. While serving in the U.S. Army, learning the art of camouflage make-up taught him to redirect light and shadow to design and disguise. TARANTOLA works as a Styles Director with major beauty industry pioneers including Clairol, Chanel, Matrix, Loreal, Yves Saint Laurant, and the Cactus Salons and the Visual Director for Bloomingdales. His affinity for hair, make-up and fashion has deepened his skill. "It's amazing," he says, "I can make anyone look like Marilyn Monroe (his favorite subject). Just give me a paintbrush." His camera-ready images embody the astuteness of a seasoned hair and make-up designer and the aesthetic of a natural artist.